The coordination chemistry of scorpionates, anionic tripodal boron-centered ligands that readily bind to virtually all main group, transition, and f-block metals, has had a profound effect in the development of synthetic bioinorganic chemistry during the past 50 years. Highlighted in this article are some of the most meaningful results published in the area, primarily in the preparation of structural and functional model compounds for the active sites in metalloproteins and metalloenzymes, a theme that encompasses topics as diverse as nitrogen fixation and heavy metal poisoning. 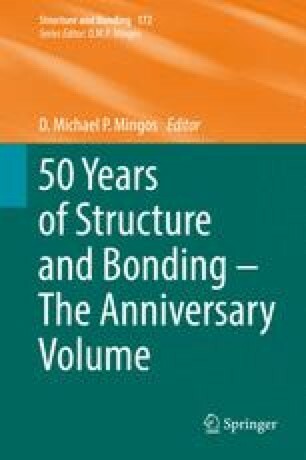 It has also been 50 years since the genesis of Structure and Bonding, so let this account also be a celebration of the many contributions that the staunch serial has had on the entire field of inorganic chemistry during the past half century. The original version of this chapter was revised: Figure 10 of this chapter was displayed incorrect. The erratum to this chapter is available at DOI: 10.1007/430_2016_213. Insightful discussions with Professors Joshua Telser (Roosevelt University), Brian Hoffman (Northwestern University), and Bill Jensen (University of Cincinnati) regarding the first public use of the term “bioinorganic” are sincerely appreciated. The National Science Foundation (Award No. CHE-0911407) and The University of North Carolina at Charlotte are gratefully acknowledged for support of our research in synthetic bioinorganic chemistry since 1996.